Imagine a dam with the force and intensity of the highly built up water pushing against its walls and practically squeaking through its cracks. It will probably begin with an initial trickle of water, peeking through the thick, protective dam walls, and dripping down the other side but it’s obvious that once that happens, there’s no turning back. 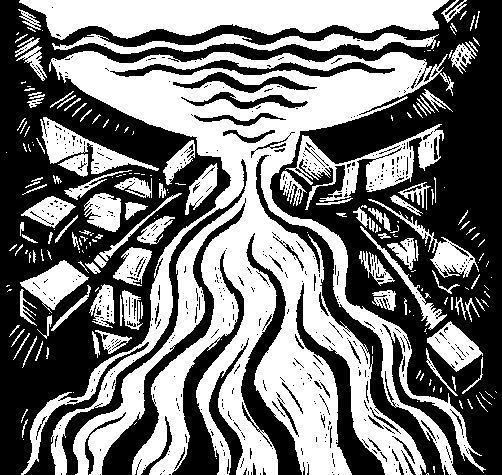 After that first little trickle, the dam is going to give and the pent up power of this heretofore static water is going to explode through the walls and pour and gush out, making the dam seem like it never existed. This is the easiest way for me to describe what I feel happening in my lower body these days. For a few weeks now, I feel like there’s more energy (the best word I can come up with) in my legs. They feel more active, more awake, as if they’re just about ready to jump up from their slumber and begin to move again. Often times, when I lie there and really concentrate and channel my attention and intention to specific parts of my legs, it feels like they are just about to obey my command and spring into action. Sometimes, I can get them to twitch and spasm a bit (movement of some kind) if I really think about it. It may be random but it’s something. I always talk about how difficult it can be to notice change and improvement in my body. Because I’m living this recovery day to day, I can’t easily tell what’s better today compared to yesterday or last week. But when it comes to this recent feeling in my legs, there’s no denying that they feel a bit different. I don’t have any proof, and I don’t yet have any motor control in my legs (but I can still wiggle the toes in my right foot! ), and there’s no way for me to predict how soon this will happen. All I know is the gut feeling I have that I think things are on the verge of changing. Maybe this is blind optimism, maybe this is me trying to manifest my own destiny and attempt to bring about the change that I so desperately want, and maybe I have it all wrong. But I really don’t care what it may seem like. At the end of the day, these legs feel different than they used to and I think it’s only a matter of time before that water gets through the cracks of the dam, starts pouring out the other side, and eventually knocks the whole dam down and flows like it used to. This is great to hear Arash! I don’t think it’s “just” blind optimism (though of course that helps) – it sounds very grounded and real. Keep thinking this way, and willing your legs to twitch, and you will be walking again soon! Envisioning the progress is part of the healing! How exciting! Your strength and determination is quite amazing, I really do believe that you’re gonna do this. Can’t wait for that post to let us know the damn has burst. Trust your instinct or gut feeling, it is usually the truth. That’s what I have learnt in life. Nobody besides you can truly know what going on in your body even with the latest technology. Trust yourself, you are on the right track. Success! Arash: This is great – particularly to sense your genuine enthusiasm with the actual, positive changes taking place in your body. It’s also a wonderful change in tone from some of your earlier reflections of doubt and frustration. Your determination and commitment are paying off, and it’s really very exciting to see that you’re finally seeing the proof and outcomes of all that. For those of us who have observed you, we’ve seen the progress more dramatically than you’ve probably felt it til recently – this is one of the greatest frustrations of this healing process: to be tempted to doubt ourselves and those shrouding us with their consistent encouragement and help. Do they really see any progress, or are they just being good friends and trying to keep us from losing hope.? Your dedication, commitment, perseverance and willingness to share your experience so authentically is not just fueling your own spirit, but inspiring others. From the little I’ve come to know about you, I have no doubt that you are going to achieve everything that’s possible and that you want for yourself. Along the way, I hope you’re also being inspired to move into new vocational paths that will continue to offer others all the wisdom, hope and help that you are learning for yourself towards practical steps of maximum recovery, mobility and independence. Thanks as always Tom. I know what you mean about trying to figure out if friends are just trying to be supportive or if they actually notice the changes in us. I know that things have improved and I’m aware of some of the bigger changes, but honestly I don’t really care until it affects my lower body. My shoulders and arms can be as strong as ever, but I want my legs back. I’m sure you’re learning a lot in Atlanta and I look forward to hearing about your experiences there. I’d be happy to chat with you more and discuss other options for your rehab. I’ve been finding new things that I really enjoy doing and that I would recommend (i.e. swimming). Arash: Hope this finds you well and basking in the glow of your recent fame with the Al Jazeera piece — so cool! Trust your gut instinct completely. ‘Feeling different’ is a great step in my book. I know this much from my own experience. Sometimes you don’t need to know why, or how, body awareness (or change) happens, just the very fact that it’s in this state leads to possibilities. Keep up the positive thinking and don’t let anyone persuade you otherwise. In Australia we had a highly aclaimed TV advertising campaign for travel to the Northern Territory (Australia’s northern state). It said “you’ll never ever know if you never ever go”. Keep that in mind as you travel your healing journey. Satisfaction is the death of desire! Keep on wanting more! You create your own destiny… you are in control. I believe you will make it happen! Amazing news! This isn’t just optimistic thinking, you actually feel something different. And no one knows your body better than you do. This is a moment to be celebrated, to be enjoyed, and to be used as fuel to keep on working, particularly on the hard days. I can’t wait to hear about your next big (and little) moments. This news is so wonderful! Your faith in your recovery has brought you this far. and what is going on with our bodies. Keep up your amazing hard work. You inspire me every day as I fight chronic pain in my back due to a multitude of issues. They are small challenges compared to the dam you are moving toward breaking through. As your former Prof, I just have to say your blog is amazingly well written. Your determination is infectious. I would not have expected any less from you! Hot dog!! That’s awesome! I’m sending good energy your way as the dam breaks! Manifest away!! I’m so excited for you! I am so so excited for you!! You continue to be an inspiration for all of us. Your amazing hard work and determination will make it happen, I am sure. LOVE it. Let it rain!!! I have been experiencing this same feeling for a month now, and every day I can feel more. It’s that rumbling in your legs when you’re trying to move them, right? Inconsistently, I can get the quads or hips to fire, more on the right. It’s one of those wonderful feelings that reminds you of how much progress you’re making. Good things are coming your way, Arash. I feel it. Yes! This just made my day. I remember, so clearly, during those first few weeks in the hospital, while massaging your feet and legs, feeling slight pulses of energy in your feet, and thinking to myself, it may take a while, but these feet will walk the Earth again! So thrilled to hear that you are feeling this energy gaining strength and momentum. I’m all for dam removal, ESPECIALLY THIS ONE! Much love. you’re going to be fine. it’s electricity. it’s your electricity. you and your body will know each other so well through this process. let the water erode the dam, it will. a trickle through a hairline crack, more water pushing through the concrete, a steady stream as if from a tap, pushing away old tensions that built up during this time of healing, and finally flow — unending, nourishing, clear, strong, persistent, unable to be compressed. i will imagine it for you and it sounds like many many others will too.